» Can the Thunder Stop LeBron James? During Game 4 on Tuesday night, Miami executed their plan to post up LeBron James. He essentially played point guard, with his back toward the basket. 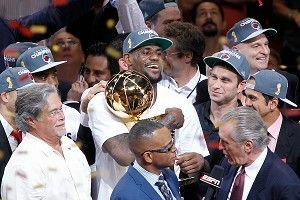 James caused havoc for the Thunder, leading to many opportunities for himself and his teammates. James was nearly unstoppable once he got the ball with his back toward the basket. He backed down his man until he saw a double team or until he was close enough to make a move at the rim. Mike Prada of SBNation tracked the possessions, showing that James created 21 points on 14 post-up possessions — an extremely efficient rate. You can be sure that Miami is going to go right back to that strategy. What can the Thunder do to stop it? Some analysts have suggested that Serge Ibaka should guard James to keep him on the perimeter. Ibaka might be a great help defender, but his on-ball skills are not as strong. 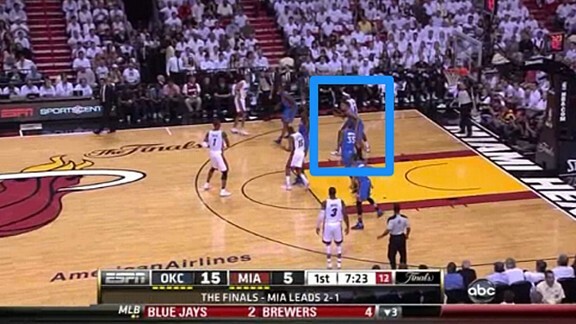 I think the Thunder’s best chance is to the front of the post, which is exactly what Miami did to get to the Finals. The Thunder can duplicate that strategy. In fact, on one possession early in Game 4 they did successfully front the post. While Mario Chalmers brings up the basketball, James and Shane Battier are in a stacked position on the block. James sets a pin-down screen for Battier when Chalmers crosses half court. After the pin-down screen, James simply turns and uses his body and size to seal off his man, Thabo Sefolosha. 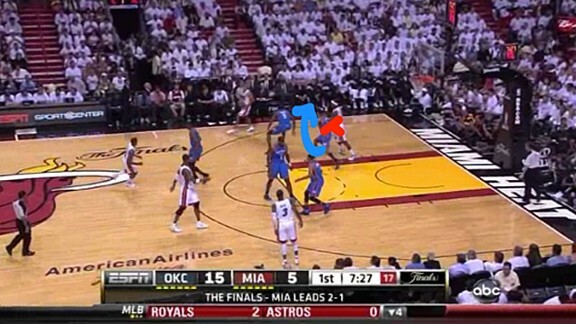 However, Sefolosha works to get in front of James, fronting him and taking away the passing angle. Meanwhile, Kendrick Perkins dives into the paint to dissuade the lob pass over the top of Sefolosha, forcing Battier to swing the ball to Chris Bosh. The simplest counter to fronting the post is swinging it to the top of the key, creating an angle, and lobbing the ball over the top. Sefolosha is a smart defender, though. As the ball goes to Bosh at the top of the key, he slides to a “half front” position, preventing a lob while making that passing angle difficult for Bosh. As a result, Bosh is forced to pass to Dwyane Wade, who makes an incredible play to bail out his team. 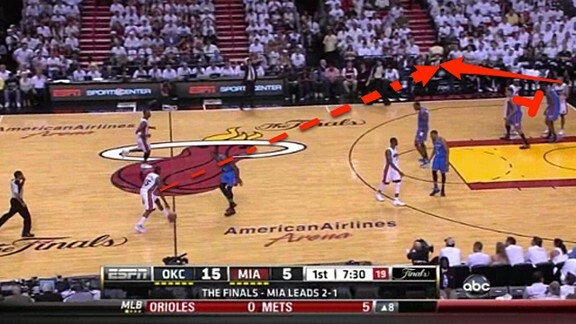 Even though Miami scored on this possession, the Thunder defense disrupted their game plan. When the Heat post up James (and Wade), they stop moving and dedicate almost their entire offense to getting the ball into the post. If the Thunder can eliminate that option, the Heat don’t have much to fall back on. Here’s another example, this time with Kevin Durant. 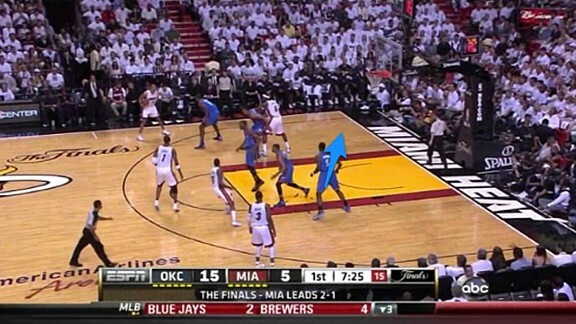 Here, Durant starts this possession by fronting James, using his length to take the passing lane away. As soon as that happens, the Heat panic. Chalmers dribbles the air out of the ball, pointing, looking for someone to help him out. Eventually, Durant bails James out by moving behind him, but we can see the potential fronting has. Fronting LeBron James is tough and isn’t an easy solution, but it is effective. Carmelo Anthony, who has a similar (but better) post game to James’s, struggled mightily with fronts in the first round of the playoffs. Sefolosha and Durant could have a similar impact, helping them take the series back to Oklahoma City.